Mensusa https://www.mensusa.com/articles/burgundy-dress-shoes-they'll-go-with-anything.html Burgundy Dress Shoes- They'll Go With Anything Burgundy dress shoes can be paired with a variety of suits and jackets in many colors and styles to make a bold style statement. If you have found the perfect suit for your next semi-formal occasion but are struggling to find the right shoes to go with it, or you're at a loss for the perfect shoes to pair with other attire for even less formal occasions, you're in luck. When you are trying to add a little color to your style and want to stand out, it is not always easy to find the right color attire to match your shoes. Some color shoes don't quite go with everything, but some, such as burgundy dress shoes, do. If you are looking for a bold accent to spice up your style, choosing a burgundy dress shoe for your next semi-formal event or just to wear around in a less formal setting is a great option for you. Burgundy dress shoes are a great choice because there is very little they do not pair well with as long as you let them shine. This color and type of shoe will allow you to express your style and give your outfit just the right kind of bold accent it needs without making you stick out too much. Here is some insight on how to wear burgundy dress shoes, what goes best with them and how you can use them to fit your preferences and style regardless of the occasion. Matching your colorful suits with your shoes is just as important as matching your suit with your dress shirt and tie. If you are going with a dark burgundy dress shoe, your best bet is to pair that with either a black or charcoal colored suit. Pairing them with a medium-grey suit, a navy suit, a blue suit or a brown suit are also acceptable options. When wearing burgundy dress shoes, it is best to avoid lighter colored suits like tan or light grey. However, you can incorporate wearing burgundy dress shoes into your own personal style any way you see fit. Wearing a European suits says that you mean business. 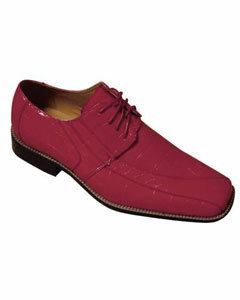 Add in with your suit a pair of burgundy dress shoes and you will easily be the boldest fashion statement in the room. Wearing your burgundy dress shoes with a two-button suit means you are willing to mix and match styles, which can be great if everyone else around you is wearing a formal suit but you want to be able to set yourself apart from them in some way. Keep the color of your suit neutral so that your shoes can stand out in a way that makes you memorable. If you are going to add a touch of elegance to your business attire, balance that out with your shoes to create a look no one else will have. Heading to a less formal event but still want to highlight your bold style with burgundy shoes? You can most certainly do this, even with leather jackets for men, as long as you follow a few basic fashion rules. First off, you should always keep your jacket and shoe color within the same color family. So in this case, if you're going to wear burgundy dress shoes, you will want to stick with the same colored leather jacket. That being said, don't get too stressed out if it is not the exact same shade. As long as they are both burgundy, in this case, close is close enough. Burgundy dress shoes go with just about any kind of formal or other attire, regardless of the color or whether it's a less formal option like a leather jacket or something much more formal like a tuxedo jacket. Burgundy shoes are versatile, which means you can pull of wearing them with jeans but you can also wear them with a suit and they will still look good. Just like your European suit, pairing your burgundy dress shoes with a men's tuxedo jacket will allow you to arrive to your formal event showing off a very unique style that is formal with a twist. Always make sure the color and pattern of your tuxedo jacket is neutral, such as black, so your burgundy shoes can make a statement of their own at the type of event that requires wearing a men's tuxedo jacket. As long as you make sure to keep your burgundy shoes the main accent of your outfit and do not overwhelm it with solid burgundy with every piece you wear, you will have no problems adopting this style choice.